Crystal Acoustics introduces ingenious full bipolar surround sound speaker system for real cinema in the home. The Greek company has used its home cinema know-how to deliver a set-up that stands out from the crowd in terms of performance, style and value. 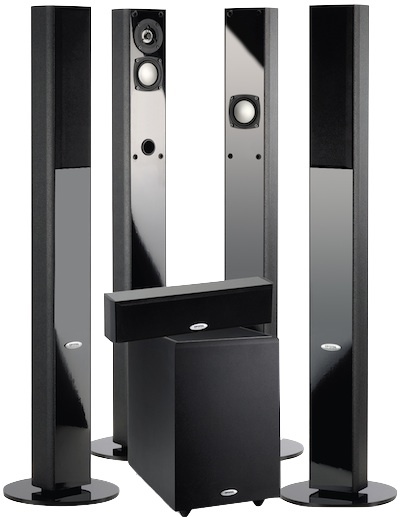 The company's elegant £600 BPT system comprises sleek, compact, 105cm high tower speakers finished in a luxurious high gloss black – the perfect match for today's ultra-slimline screens. Here beauty is more than just skin deep, however. Not only does the BPT system look gorgeous, but it also sounds beautiful thanks to state-of-the-art engineering, including a bipolar speaker configuration. The BPT's slimline tower loudspeakers make use of bipolar technology, and together with the THX Select certified subwoofer, the result is a much more cinematic experience. The bipolar driver arrangement — a pair of 7.5cm drivers pointing in different directions, wired in-phase – offers a closer match to the surround speakers found in cinemas. In this instance a rear firing mid/bass driver creates ambience and spaciousness, delivering a widely dispersed soundfield that immerses the listener in movies or music. The magnetically shielded tower speakers mid/bass drivers are partnered by a 2.5cm tweeter with neodymium magnet. The narrow front baffle of these designs delivers reduced diffractions and better dispersion for a more precise sonic image. A timbre matched centre channel handles dialogue with aplomb, while the THX Select-certified THX-10SUBt offers the low-end power. This subwoofer features a flat anechoic response from 35Hz to 200Hz and accurate in-room response from 19Hz to 350Hz for the very clearest low-end frequencies. A high quality 120 watt amplifier, with an impressively high sensitivity of 92dB/W/m, delivers a powerful and dynamic sound that adds weight to films and music. Its ten-inch long throw driver incorporates a light but rigid specially treated paper cone in construction for fast response without distortion. This is backed by serious magnets for a deep, fast, dynamic transient bass with sonic accuracy. The cabinet is heavily braced at critical points to offer as acoustically dead an enclosure as possible. Such extensive strengthening of the cabinet panels maximizes the dynamic capability of the designs. Matching this system are Crystal Acoustics's BPS 2.0 speakers, ultra compact, £119 per pair, bipolar satellite designs that deliver unequalled sound dispersion. Their small size makes them ideal for wall mounting and they can be placed either horizontally or vertically. They comprise two 7.5cm mid/bass drivers and a 2.5cm tweeter. The magnetically shielded BPS 2.0 speakers can be used as either surrounds, centre or even front channels.